thanks to js for posting on sweet addy the first promotional postcard and item being used to help promote the upcoming release of 'from a basement on the hill.' the postcard was given out at this past weekend's sunset junction in silverlake, ca. hopefully we will be seeing them in some form at record stores and other music related places. if you would like to see a larger version of the postcard, please click on the image. please click here if you would like to see the back of the postcard. ashley recently gave us an update on the elliott smith memorial fund mailing list thanking fans for donating to the fund and also giving a tally about how much the memorial fund has made. it looks like the tally from fans all over the world is $46,000 so far :) thanks a lot everyone! 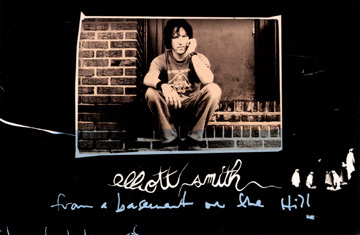 if you would like more information what the fund is, please click the elliott smith memorial fund banner above or click here! thanks to daniel for sending this in about a recent interview gothamist did with rob sacher, the co owner of new york's luna lounge. it's a short interview and rob is asked to tell one story in a new york minute and he decided to talk about elliott, who would visit the bar and worked on songs that would eventually be one elliott's record, xo. to read this great story, follow this link to the gothamist and scroll a quarter of the ways down. "steve kilbey (the church), mick hart, shane nicholson, abi tucker, eduardo santoni, kara grainger, joy & lara, butterfly, andy gordon and more – like they aren’t quite enough – pay tribute to the much loved and much missed singer songwriter, elliott smith. and with the previously unreleased basement on the hill album with us soon, it only seems fitting that here’s where it’s at. 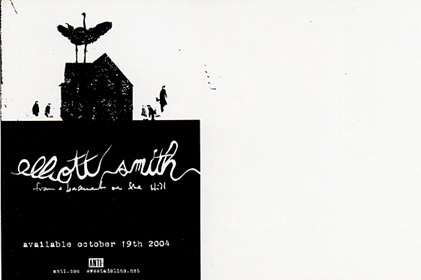 join us for a night of homage to the legacy of elliott smith." bread, matthew glasson, the olga gogolas, and matt lydon directions: f to second avenue, 6 to bleecker call 212-842-boog(2664) or email editor@boogcity.com for further information all proceeds go to the elliott smith memorial fund, which benefits abused children through art. thanks to duncan for pointing out that the hmv website is listing a vinyl version of elliott's upcoming record, 'from a basement on the hill', for european music buyers. rumors are that anti- or another label will release a vinyl version of the album in the united states and canada but no official announcement had been made. if you are interested in ordering the vinyl version through the u.k.'s hmv, please go here! thanks to rod, chris and alex for taking the time to clarify information about to 2 track on 'from a basement on the hill.' according to them 'twlight' is actually the fan titled 'somebody's baby.' while ostriches & chirping is a short (instrumental) track of actual ostrich sounds and chirping. except ostriches & chirping, this now means that elliott played all these songs live at one point and there are no unheard songs on the record even though they most likely will sound differently from how elliott played the songs live.